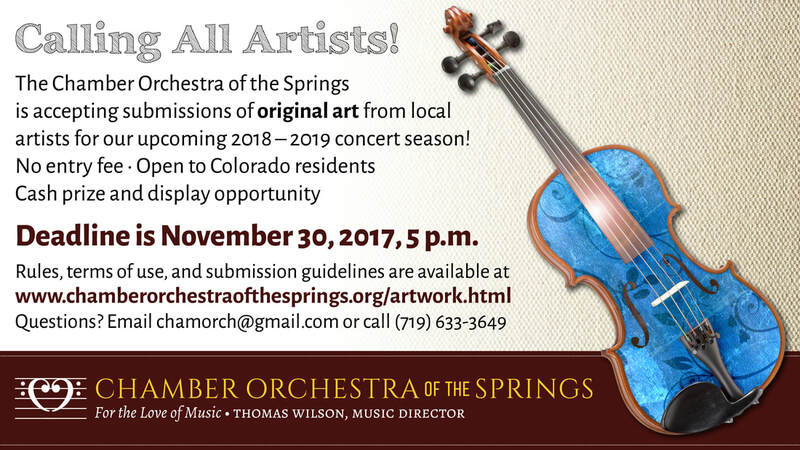 The Chamber Orchestra of the Springs is accepting submissions of original art from local artists for our upcoming 2018-2019 season. Six (6) works will be selected to be featured on one of each of our six (6) subscription concerts. Winning artwork will be credited to each artist and used in print and digitally in promotion of the concert, including but not limited to concert programs, concert advertising, newspapers, flyers, brochures, social media and websites. In addition, each artist will be awarded $100 per winning entry, provided with two (2) complimentary tickets to the concert and invited to display the original work at the featured concert. No entry fee. Entrant must be a resident of Colorado. Open to professional and amateur artists, as well as high schoolers pursuing an art vocation. Art submission(s) must be original two-dimensional work. Any medium is acceptable. Artists may enter up to six (6) works of original art. All entries submitted will be considered for all concerts unless specified by the artist. Artwork should not be watermarked or stamped with copyright or trademark symbols. Artist signatures are acceptable and expected. Artwork can be created digitally or traditionally (non-digital). Traditional artwork should be submitted in a digital format such as a high-resolution scan or high-resolution photo. Artwork must be submitted in one of the following formats: tiff, png, pdf or jpg; 300 dpi with a minimum of 2000 pixels on the longest side. Artwork must be in portrait format (3:4 ratio if possible). Color artwork will be given preference. Artwork that does not meet formatting requirements will not be considered. By entering this art competition, you are granting the Chamber Orchestra of the Springs a non-exclusive perpetual license to reproduce images of your artwork on all marketing material; digital and print, for the Chamber Orchestra of the Springs 2018-2109 season and agree to abide by all rules stated above.. Selected artists will be given full credit in digital and print formats. Deadline to submit artwork is Thursday, November 30th at 5pm Mountain Standard Time. Entries must be submitted electronically, either through the website or via email. The winning selections and artists will be announced Tuesday, December 5, 2017.